Speedkore, the Wisconsin company behind the wild carbon-fiber twin-turbo Dodge Demon that blew up the car internet earlier this month, has something else crazy for SEMA this year. It's called the Evolution, and no, it's not a 1970 Dodge Charger. It just looks like one. Speedkore actually designed a custom chassis for this car consisting of a steel ladder frame and an aluminum floor pan. All the bodywork is made from carbon fiber and billet aluminum, while a roll cage provides extra rigidity and safety. So there's no 1970 Dodge Charger here at all. The motor is a modern Mopar classic, however—it's the 6.2-liter supercharged V8 from the Dodge Challenger Demon, but modified with a smaller drive pulley for the blower, new fuel injectors, a dry-sump lubrication system and a custom intake and exhaust manifold designed by Speedkore. The company claims 966 horsepower at the rear wheels, all of which is managed by a Tremec T-56 six-speed manual transmission. Speedkore's vice president, Dave Salvaggio, claims the Evolution weighs around 3200 lbs, which should mean this thing is very quick. It has the hardware to deal with that crazy power-to-weight ratio, with Penske coilovers, Brembo brakes with six-piston calipers up front and four-pistons in the rear, and HRE forged wheels wrapped with Michelin Pilot Sport Cup 2 tires. Still, it's easy to imagine this thing being a handful. Salvaggio says the Evolution is designed to be "docile" in traffic, but we're not sure if it's actually street legal, since it's not actually a 1970 Dodge Charger. We've reached out to see whether or not this is the case, and we'll update when we hear back. 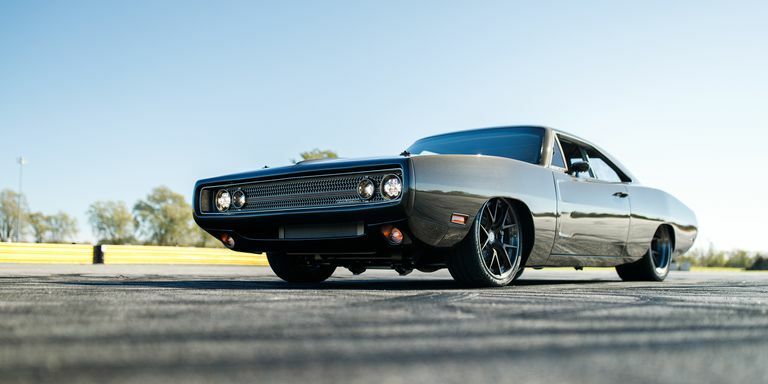 The Evolution continues what Speedkore started in 2015 with its well-known Tantrum, a 1970 Dodge Charger pro-touring car with a 1650-hp 9.0-liter twin-turbo V8 made by Mercury Marine. The Evolution might be down on power compared with the Tantrum, but its light weight should help make up for that. Speedkore also has a couple of videos on its YouTube channel detailing the build process of the Evolution, which is well worth a watch. And if you're at SEMA, you can check it out at the Meguiar's booth.